Last year, I began adding apartment buildings to my portfolio. While there are similarities to single family investing, there are some new quirks to learn. As investors, we’re always looking for ways to increase the value of our properties. Most of us are familiar with the more conventional ways of doing so: decreasing expenses and increasing income. What if I told you it was possible to increase income without raising rents or decreasing expenses? Let’s explore a few ways that is possible. If you own a fairly large complex, it would make sense to install a vending machine. Assuming you’re an expert of your market, you could effectively target your tenants by placing products you know your tenants would want in the machine. The best place to put your vending machine is in an area that generates a solid flow of tenants; the laundry room or near the pool (if you have one and your property is located in warmer markets) are two good choices. 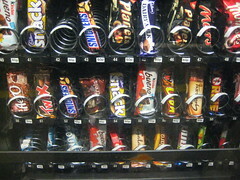 Even modest vending revenues increase the property’s value significantly. Assuming the property is in a 6% Cap rate area with yearly vending revenues of $720, you would have increased the property value by $12,000! Not too shabby given our modest revenue assumptions. As real estate investors, we know that the value of commercial buildings is determined by dividing its Net Operating Income (NOI) by its Capitalization Rate (Cap Rate). By definition, Value = NOI / Cap Rate. In other words, the property’s value is greatly magnified by relatively small increases in Net Operating Income. To illustrate, for a given Cap Rate (say 6%), every extra dollar in NOI increases the property’s value by $16.67 (=$1.00/0.006). In low Cap Rate areas like San Diego, that means there’s a huge opportunity to increase your building’s value dramatically! There are a number of obvious things one may do to positively affect the NOI of a property: raise rents, cure vacancy, decrease expenses. Well, what do you do if your building is 100% occupied at above market rents, and the property is so efficiently managed that you can’t think of a way to decrease expenses? Should you accept the status quo and simply keep up the good work? You could, but where’s the fun in that? You would be overlooking the unlimited number of ways to optimize not only your property’s NOI, but your returns as well. Investing in real estate is just that—INVESTING. Risk comes with the territory. The key to successful real estate investing lies in the analysis and due diligence of a potential income property. When done prudently and methodically, the investor’s risk is not only greatly mitigated, but he or she should have clear line of sight as to the property’s return potential. Sounds relatively straightforward, right? Well, this task becomes much harder when the seller tries to make a monetary gain by feeding on the inexperienced investor’s lack of knowledge or inadequate due diligence. Luckily, we’re all savvy investors at BiggerPockets.com and we know how to spot these seller exaggerations and fallacies. Let’s examine some of the common ones.